Anolon - SureGrip Non-Stick Nylon Mini Solid Turner An essential gets an upgrade in this SureGrip mini turner from Anolon featuring a tapered blade that slides easily under food. 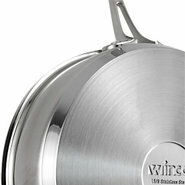 The heat-resistant nylon is safe for non-stick cookware. Oxo - Good Grips Nylon Ladle With nylon that's safe for any cookware surface and a slim handle that makes serving easy this Good Grips ladle from Oxo is a must-have for when soup's on. Anolon - SureGrip Non-Stick Nylon Mini Slotted Spoon A tapered head in heat-resistant nylon makes stirring more thorough with this SureGrip slotted spoon from Anolon. It's safe for non-stick cookware too. J.A. Henckels - Zwilling J.a Henckels Aurora Steamer Insert Enjoy fresher tastes and lighter foods with this Aurora steamer insert from J.a. Henckels Zwilling. 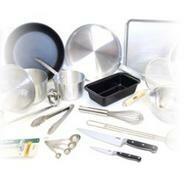 The insert is designed to fit larger cookware giving you enough capacity to steam fish or veggies for family meals.